An EPA org chart represents the organizational chart of the United States Environmental Protection Agency (EPA). It is an agency of the America federal government. The main purpose and duties of EPA are to protect and enforcing national standards of the environment by various rules. President Richard Nixon proposed the set-up of EPA in the 1970’s. The House and Senate manages the order of EPA. The headquarter of EPA is in Washington, D.C. The agency operates environmental issues including assessment, research, and education areas. In 2017 Trump proposed a considerable decrease in the overall budget of EPA. Such movement may further reduce around a quarter of the agency jobs. 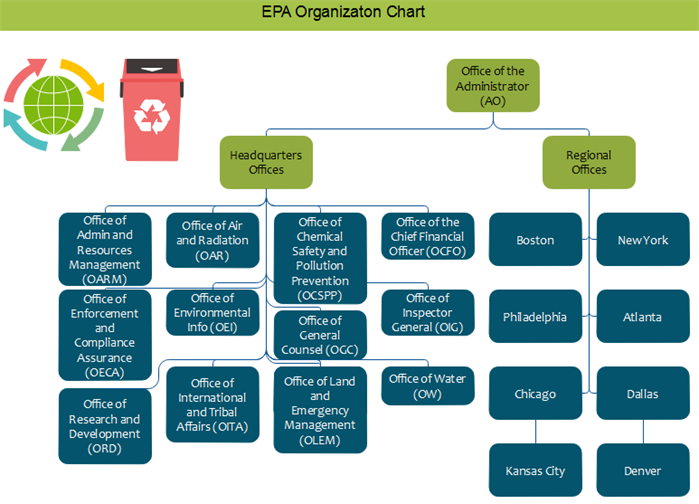 Here you can see an overview of the EPA org chart. Feel free to check more details for EPA org chart from below. The Office of the Administrator (AO) officers executive support for the EPA Administrator. What’s more, AO provides assistants for the leadership of EPA’s events to protect human environment. The sub-departments of AO including the Office of Children’s Health Protection (OCHP), the Office of Civil Rights (OCR), the Office of Congressional and Intergovernmental Relations (OCIR) and so on. You can refer to the overall framework of the AO of EPA below. 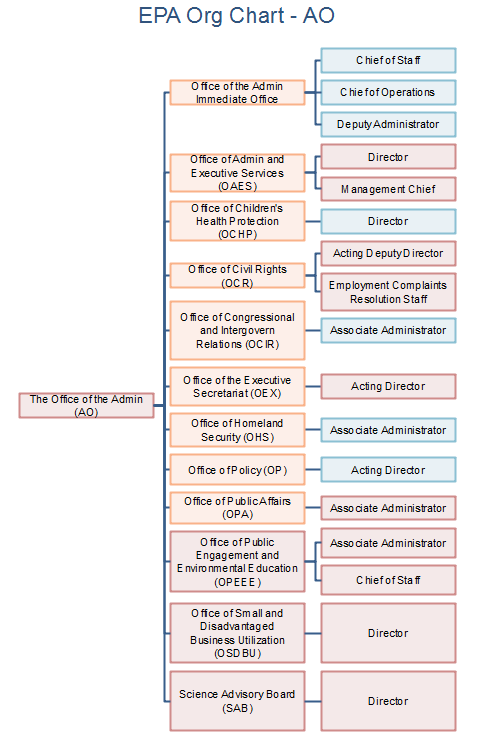 The headquarters offices of EPA org chart cover a number of divisions. For example, the Office of Administration and Resources Management (OARM) offers national policy and monitor a lot of essential functions for the whole EPA. The Office of Air and Radiation (OAR) promotes national programs, and regulations especially for air pollution and radiation exposure. The OCSPP office manages issues about protecting household health, and the potential risks from toxic chemicals. The Regional Offices of EPA is consist of a series of State and city offices including New York City, Denver, Chicago and so on. Feel free to check more details of these offices from the below chart. Wanna Know What Is the Software for All These Diagrams? Simply click Org Chart Creator. Alternatively, feel free to use this easy org chart creator for more advanced settings and management of your business teams.